Brit Hume Logic: We should be happy with a $6.2 billion military budget! The Senate Republican healthcare plan's proposed cuts to Medicaid, one of the most contentious parts of the bill, get progressively steeper over time, according to a Congressional Budget Office analysis released Thursday. The nonpartisan CBO on Monday released its first analysis for the Senate bill, the Better Care Reconciliation Act, and estimated that provisions in the BCRA would result in $772 billion in cuts to Medicaid by 2026. That amounts to 26% less funding for the program than than under the current law, the Affordable Care Act. Read more about Brit Hume Logic: We should be happy with a $6.2 billion military budget! Read more about END OF QUARTER FUNDRAISING ALERT!! In which I get a nice profile piece at Medium for my birthday. A few months ago, tech/media journalist Simon Owens interviewed me for a profile piece he wanted to write about ACASignups.net...basically, the whole story of how a Michigan website developer somehow became a national data/analysis source for All Things Obamacare. I had a couple of similar stories written about myself and the site by Sarah Kliff of Vox and Miranda Neubauer of TechPresident, but those were both over 3 years ago, in the midst of that insane first Open Enrollment Period, when the site was at peak media attention. I've been cited/quoted quite a bit since then, but most of that has been about the actual data and analysis, which of course makes sense. Owens' story was published this week, and today just happens to be my birthday, so as a little present to myself, I'm doing a bit of #HumbleBragging by sharing the story link. Read more about In which I get a nice profile piece at Medium for my birthday. THIS IS ALL FAR FROM OVER. CELEBRATE A FEW HOURS. Then come back and read this. ... there's the other doomsday possibilities, like Trump issuing an executive order stopping payment on CSR reimbursement payments to carriers. I'll be addressing all of this and much more in the near future, of course, including my own suggestions for how the ACA should be changed to repair/improve the situation. For the moment, however, I'm very tired, it's a beautiful Friday afternoon, and I'm going to go play with my kid for a few hours. I think I've earned it. Read more about THIS IS ALL FAR FROM OVER. Kurt Busiek is a talented writer and comic artist (and he's apparently pretty famous in the industry...I'm out of the loop on that sort of thing). …the AHCA is adding a penalty that says if you don’t buy insurance you can’t buy insurance for 6 months. Huh? BCRAP bill includes $2B to help states spend money on hookers & blow. I've had to spend most of the afternoon/evening taking care of my kid (he has a 2-hour karate class Monday evenings), so I'm just now getting a chance to actually read the CBO's score of the GOP Senate's BCRAP bill, beyond their general summary of the score which I simply posted verbatim (with a handful of highlights and notes) earlier today. There's a lot to digest; I'm sure everyone's already heard the main lowlights/takeaways: 22 million losing coverage by 2026 (14 million kicked off of Medicaid, 7 million losing individual market coverage, 1 million miscellaneous/rounding, I presume), "deficit savings" of around $321 billion (giving Mitch McConnell $202 billion to try and buy the votes he needs from a handful of "moderate" Senators) and so on. I'll be writing my full analysis for tomorrow, though there's probably not much point in it, since every other healthcare reporter will already have beaten me to the punch. Read more about BCRAP bill includes $2B to help states spend money on hookers & blow. At this rate the GOP only needs 22 more Trumpcare bills before they won't screw anyone! The Congressional Budget Office and the staff of the Joint Committee on Taxation (JCT) have completed an estimate of the direct spending and revenue effects of the Better Care Reconciliation Act of 2017, a Senate amendment in the nature of a substitute to H.R. 1628. CBO and JCT estimate that enacting this legislation would reduce the cumulative federal deficit over the 2017-2026 period by $321 billion. That amount is $202 billion more than the estimated net savings for the version of H.R. 1628 that was passed by the House of Representatives. Read more about At this rate the GOP only needs 22 more Trumpcare bills before they won't screw anyone! Louise Norris gave me a heads' up regarding the Indiana 2018 rate filings. Anthem BCBS and MDwise, which currently have around 46,000 and 30,800 exchange enrollees each, are dropping out next year, meaning nearly 77,000 people will have to shop around. Anthem is sticking around the off-exchange market....but only in a handful of counties. Norris indicates around 64,687 total Anthem enrollees; minus the 46K on-exchange, that leaves roughly 18.7K off-exchange enrollees, virtually all of whom are expected to drop due to Anthem dropping out of all but 5 counties (plus, of course, the large rate hike). The Billion Dollar Question: Will CBO count BCRAP plans as "health insurance"?? The CBO score of the GOP Senate's #BCRAP bill is expected to be released early next week, just days (or, who knows, hours?) ahead of Mitch McConnell's rushed-through vote. However, from a political POV, the bigger question is how many people the CBO projects will lose coverage by 2026 if BCRAP becomes law. Read more about The Billion Dollar Question: Will CBO count BCRAP plans as "health insurance"?? The GOP pushed the ACA into the water, wants credit for pulling it out. OK, this metaphor will take a bit, but bear with me. On March 16, 1981, CBS aired the 17th episode of Season 9 of M*A*S*H. For those of you too young to remember, M*A*S*H, set at a U.S. Army medical camp in Korea during the Korean War, was one of the most successful TV shows in history, running 11 seasons. I believe the series finale remains the most highly-viewed broadcasts in history. While M*A*S*H started out primarily as a sitcom, it evolved over the years into more of a drama with comedic moments. Freedman asks Hawkeye about his childhood, and Hawkeye, among other things, mentions his cousin Billy. Read more about The GOP pushed the ACA into the water, wants credit for pulling it out. Remember the "Wheelchair-bound granny thrown off a cliff" ad? Guess what. Back in 2011, when Paul Ryan and House Republicans first attempted to privatize Medicare, a progressive PAC ran the ad above. In it, "America the Beautiful" plays as we see a young, Paul Ryan-ish looking young man pushing an elderly, wheelchair-bound woman down a nature path...and eventually pushing her right off of a cliff. Needless to say, it caused quite a bit of controversy at the time. Read more about Remember the "Wheelchair-bound granny thrown off a cliff" ad? Guess what. I spent almost all of Part One discussing the butchering that the GOP Senate's BCRAP bill does to the individual market, because that's the primary focus of my work here at ACA Signups, but the truth is by far the worst fallout will be on the Medicaid side of things...and most of the damage doesn't even have a damned thing to do with the ACA itself, since it relates to pre-ACA Medicaid. I'll get to the Medicaid side in depth in Part Three. However, there are still a few more things I need to discuss regarding the individual market: The sub-100% FPL population and how it relates to Medicaid expansion. Of course, I say "supposed to" because two of the three legs are simply too short, causing it to lean over somewhat. The Centers for Medicare & Medicaid Services (CMS) is releasing a county-level map of 2018 projected Health Insurance Exchanges participation based on the known issuer participation public announcements through June 9, 2017. This map shows that insurance options on the Exchanges continue to disappear. Plan options are down from last year and, in some areas, Americans will have no coverage options on the Exchanges, based on the current data. Trump's HHS Dept. is Propagan-TASTIC! ...Most of the actual staff...the career employees at CMS/HHS, many of who've been there through more than one administration, will likely remain, and will do their jobs to the best of their ability, including trying to compile and publish data as accurately as possible. HOWEVER, their bosses...the HHS Secretary and, I presume, the head of CMS...will be appointed by Donald J. Trump and confirmed by a 100% Republican-controlled Senate. Given Trump's long, disturbing history of flat-out misstatements (aka "making sh*t up out of whole cloth"), and the type of sycophants he's likely to put into place, I can't guarantee with any certainty that the numbers spouted off by them are going to bear any connection with reality. Maybe they'll be accurate. Maybe they'll be off slightly. Maybe they'll be completely removed from any actual numbers. Who the hell knows? Read more about Trump's HHS Dept. is Propagan-TASTIC! ALL-NEW: How many would lose coverage under Trumpcare in your COUNTY? An eternity ago (aka back in January/February), I attempted to compile and break out estimates of how many people would likely lose healthcare coverage in the event of a full, "clean" repeal of the Affordable Care Act (that is, a complete repeal of the ACA without any replacement healthcare policy whatsoever). I concluded that the total added up to roughly 24 million people nationally: Around 8.2 million highly-subsidized Individual Market enrollees, nearly 15 million Medicaid expansion enrollees and 750,000 Basic Health Plan enrollees (NY & MN only). I then attempted to break these out by both County and Congressional District​. I went with a "clean" repeal because there wasn't any actual replacement plan available to compare with. Read more about ALL-NEW: How many would lose coverage under Trumpcare in your COUNTY? Things are looking pretty precarious in Iowa for 2018, with Wellmark and Aetna bailing entirely on the state's individual market. The good news, such as it is, is that Medica has stepped up to the plate as the sole insurance carrier filing to offer indy market policies (on the ACA exchange or off, I believe) across all 99 counties next year. The bad news--although I can't really say that I blame them under the circumstances--is that they're insisting that they'll need a big rate hike to do so. One of the last insurers on Iowa's ObamaCare exchanges announced Monday it would sell plans in 2018 but proposed an average rate increase of 43.5 percent. Boy, #12 on my "If I Ran the Zoo" compilation of ACA fixes seems to be taking off! Earlier this year, in response to popular demand, I put together an extensive list of serious proposals to actually repair, improve and strengthen the ACA itself, as opposed to a) tearing it apart and replacing it with the GOP's Godawful pile of crap or b) tearing it apart and attempting to replace it with a total single payer system (which simply is not going to happen in the near future no matter what). I came up with some of these ideas on my own (though I'm sure others have made similar suggestions), but most of them have been widely discussed by various heatlhcare wonks over the past few years. Some would require additional funding, but others are simply regulatory and wouldn't cost a single state or federal dime. Read more about Boy, #12 on my "If I Ran the Zoo" compilation of ACA fixes seems to be taking off! OLYMPIA, Wash. - Eleven health insurers filed 71 health plans for Washington state’s 2018 individual and family health insurance market, with an average proposed rate increase of 22.3 percent. No health insurer filed plans in two counties – Klickitat and Grays Harbor. Insurance Commissioner Mike Kreidler has been reaching out to insurers since they filed their plans on June 7 to see if one or more will reconsider offering plans in the bare counties. “I’m very concerned by the proposed changes we’re seeing,” Kreidler said. “I know these numbers will be extremely upsetting to people who buy their own health insurance. They’re upsetting to me. We’re going to spend the next several months reviewing every assumption insurers have made to make sure their proposed increases are justified. Huh. State-based exchanges appear to be better at retaining enrollees year-round than HC.gov. OK, this was a bit unexpected. Last week I analyzed the monthly enrollment effectuation numbers through all 4 years of ACA Open Enrollment (2013 - 2017), to help visualize how the enrollment numbers flow throughout the year (and to also show how misleading the Trump CMS "attrition" report from last week was). Then, on Thursday, I wrote about a CMS powerpoint presentation from last year which provided a Holy Grail of sorts for me: Not only did it provide the monthly effectuation numbers for 2015, it broke them out by starting and ending month. That is, it divided the numbers into how many enrollees for that month had originally enrolled starting in January, in February and so forth. This is really, really important because having "an average" of 100,000 enrollees each month doesn't mean much if it's a different 100,000 people every month--that is, if a lot of people are signing up, having expensive treatments and then dropping out and then replaced by someone else, that hurts the risk pool, since the original batch aren't paying for the other months of the year when they don't require treatment. Read more about Huh. State-based exchanges appear to be better at retaining enrollees year-round than HC.gov. Has ACA Medicaid expansion surpassed 16 million people?? As regular readers know, I've been a bit obsessive about tracking down and breaking out ACA Medicaid expansion enrollee numbers. This is more difficult than it sounds, because most Medicaid reports lump expansion enrollees in with the other ~58 million or so Medicaid enrollees; only a handful of states issue separate reports of the expansion-specific population on a regular basis. Back in late November, I cobbled together the data as best as I could and came up with a total of roughly 11.3 million people nationally. However, that included a lot of 2-year old data and rough estimates. A couple of weeks later, I stumbled upon a detailed analysis from an anti-ACA financial watchdog organization, the Foundation for Government Accountability, which provided hard numbers and confirmable data source links which included more recent numbers for many states. This brought the total up to over 12.3 million. Read more about Has ACA Medicaid expansion surpassed 16 million people?? UPDATE: Too damned much happening to keep up with. Health insurer Centene Corp. plans a broad expansion of its Obamacare offerings next year at a time when many of its big rivals are retreating from the program. Centene said Tuesday that it would sell Affordable Care Act plans in three additional states: Kansas, Missouri and Nevada. The company also said it will expand in six states where it already offers Obamacare plans. “Centene recognizes there is uncertainty of new health-care legislation, but we are well positioned to continue providing accessible, high quality and culturally-sensitive health-care services,” Chief Executive Officer Michael Neidorff said in the statement. The company specializes in providing Medicaid coverage for low-income people, and has said the skills it’s honed in that business have helped make it successful in Obamacare markets. Read more about UPDATE: Too damned much happening to keep up with. Two market influences, in particular, are complicating 2018 rate setting: the uncertainty surrounding continued funding of cost sharing reduction (CSR) payments and the question of how the relaxation of the individual mandate will impact enrollment and risk pools. Read more about YOU DOWN WITH SEP? YEAH, YOU KNOW ME! The Centers for Medicare & Medicaid Services is administered by Trump/Price pick Seema Verma, who is openly doing everything possible to trash the ACA and push the AHCA, to the point of allegedly committing borderline extortion in order to help push it through. Therefore, this came as a bit of as surprise a few days ago (yeah, I'm late to the party on this one...busy week). The lead actuary for CMS, Paul Spitalnic, issued his own scoring of the impact of the AHCA on healthcare coverage, premiums and the federal budget. A couple of days ago, Trump's CMS division of the HHS Dept. released a Q1 2017 ACA exchange effectuation report. This should have been of mild interest to data geeks like me but not especially controversial...except that, as I noted at the time, they played fast & loose with which enrollment/payment data they did and didn't include. As a result, the report made it look like post-open enrollment attrition was dramatically worse in the first quarter of 2017 than it was in previous years. Instead, when you match up the data to match prior years, it looks like the retention rate as of March is actually pretty much exactly the same, or potentially even slightly better. Washington (CNN)President Donald Trump told Republican senators lunching at the White House Tuesday the House-passed health care reform bill he celebrated earlier this year was "mean," a source told CNN. Trump made clear multiple times that he was pleased that the Senate negotiations appeared to be moving away from where the House version of the repeal and replace effort ended up, according to three sources familiar with the meeting. Trump told the lawmakers that the House bill didn't go far enough in protecting individuals in the marketplace -- and appeared to use that as his rationale for why he has ambiguously called twice for the Senate to "add more money" to the bill. ...But the comment belies the celebratory Rose Garden ceremony Trump hosted earlier this year when the House passed the bill and the President championed it as "incredibly well crafted." Read more about BEHOLD THE RED MEANIES! GOP Senate not even PRETENDING to give a sh*t anymore. Senate Republicans are on track to finish writing their draft health care bill this evening, but have no plans to publicly release the bill, according to two senior Senate GOP aides. "We aren't stupid," said one of the aides. One issue is that Senate Republicans plan to keep talking about it after the draft is done: "We are still in discussions about what will be in the final product so it is premature to release any draft absent further member conversations and consensus." ...Democratic senators are already slamming Republicans for the secrecy of their bill writing process, and this isn't going to help. Republicans are sure to release the bill at some point, but it's unclear when — and they want to vote on it in the next three weeks, before the July 4 recess. Read more about GOP Senate not even PRETENDING to give a sh*t anymore. Meet Laura. Then call your Senator. I'm a partner at PowerThru Consulting, a growing national progressive digital consulting shop. At PowerThru we help nonprofits and Democratic campaigns use technology to spread their message and organize and activate their supporters online, to create change offline. We have staff in several states, and work with non-profits of all kinds and on progressive state and federal issues, campaigns and elections of all kinds. We've won four Reed awards and three Pollies for our work to date (including Best Congressional Website in both, Best State/Local Organization Website, Best County/Local/Judicial Website). I'm a regular contributor to Campaigns & Elections magazine, Huffington Post, and Epolitics. Read more about Meet Laura. Then call your Senator. As I've written about more times than I can remember, for all the very real and highly damaging GOP sabotage of the ACA over the years, there are some problems which were, quite frankly, inherent in the law as passed itself. This should be no great revelation, since it is a major piece of legislation which impacts nearly 1/5th of the entire economy is always going to have some problems to deal with, just as the 1.0 version of any piece of software will always have to have updates and patches applied. If this wasn't the case, there wouldn't be any amendments to the U.S. Constitution (not even the 2nd, so beloved by the GOP). Quinnipiac Poll: Trumpcare is hated MORE today than it was in March. This is rather amazing, really. With all the dramatic twists and turns that the Trumpcare/AHCA debacle has taken in the 3 months since it was slapped together by Paul Ryan & Co., you'd think that there would be some movement of the approval numbers, wouldn't you? American voters disapprove 62 - 17 percent of the Republican health care plan, compared to a 57 - 20 percent disapproval in a May 25 Quinnipiac University poll. Today, Republicans approve of the health care plan 42 - 25 percent, as every other listed party, gender, education, age or racial group disapproves by wide margins. Read more about Quinnipiac Poll: Trumpcare is hated MORE today than it was in March. (sigh) OK, this is getting very confusing now. The good news for me out of Maine is that they've released the filings for all three individual market carriers for 2018 (Aetna has around 1,000 enrollees but they're leaving the individual market entirely), and all three include the exact number of current enrollees, making the average rate hike request simple enough on the surface: 21.2% for Anthem, 39.7% for Harvard Pilgrim (HPHC) and 19.6% for Maine Community Health Options (one of the few remaining ACA-created CO-OPs*), for a weighted average unsubsidized increase request of 25.2%. *UPDATE: My mistake! I accidentally confused MCHO with Evergreen Heatlh of Maryland, which is in the process of converting itself from a Co-Op into a private carrier! Thanks to Louise Norris for the catch! UPDATED: THE THREE-LEGGED STOOL REVISITED. 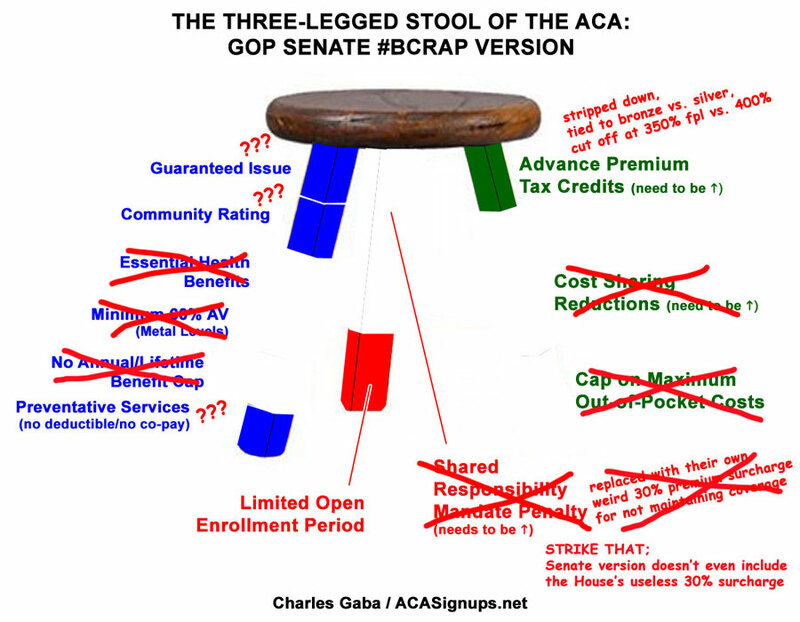 UPDATE: Some people are crediting me with creating the "3-legged stool" metaphor, which simply isn't the case; that credit goes to (I believe) MIT Economics Professor Jonathan Gruber, who came up with the metaphor back in 2006 while helping develop Mitt Romney's "RomneyCare" model for Massachusetts, which was the basis for the ACA's exchange model for the individual insurance market. I'm simply expanding on the metaphor to explain some of the terms and concepts which are swirling around these days during the repeal/replace brouhaha. Read more about UPDATED: THE THREE-LEGGED STOOL REVISITED. Six insurers inside the Exchange, Washington Healthplanfinder. Eight insurers outside the Exchange. Two insurers selling both inside and outside the Exchange. Currently, no insurer has filed plans in two counties – Klickitat and Grays Harbor. Two insurers, Community Health Plan of Washington and Kaiser Foundation Health Plan of Washington Options, announced earlier this year that they will not participate in the 2018 individual health insurance market. Thanks to Bill Hammond of the Empire Center for the heads up. 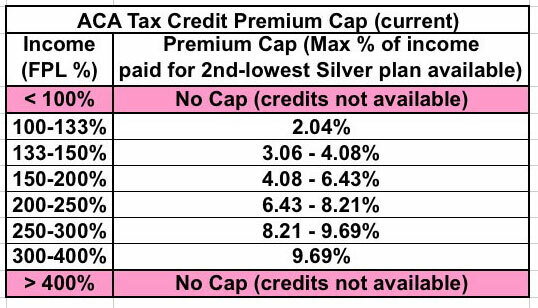 This chart sets forth the average premium rate adjustments that health insurers have requested from the New York State Department of Financial Services (DFS). There are 16 insurers that have submitted individual rates and 20 insurers that have submitted small group rates for 2018. These are the rates insurers have requested and are not the final premium rates DFS will approve. Under the Insurance Law, the Superintendent may deny or modify the requested rates if she finds that the insurer's request is unreasonable, excessive, discriminatory or inadequate based on sound actuarial assumptions and methods (Insurance Law §§ 3231(e)(1), 4308(c)). From the date DFS posts insurer rate applications on the DFS website, the public will have 30 days to submit comments to DFS on the proposed rates. The total percentage requested rate increase for individual and for small group on the chart below represent a weighted average that accounts for the relative share of overall enrollment for each insurer. Insurers in Idaho had to submit forms for 2018 plans by May 15, but they have until June 2 to file rates. Mountain Health CO-OP, SelectHealth, PacificSource and Blue Cross of Idaho all filed forms to continue to offer Your Health Idaho plans in 2018. Read more about Has Trump's HHS Dept. ALREADY stopped enforcing the individual mandate? Pennsylvania is way too easy for me this year; I don't even have to plug numbers into a spreadsheet to figure out the statewide average rate hikes. Last week Donald Trump's new Assistant Secretary for Planning & Evaluation, Stephen Parente (an avowed and open opponent of Obamacare) issued a hit piece on the ACA just one day ahead of the Congressional Budget Office's devastating report on the GOP's AHCA "replacement" healthcare plan. The ASPE report made a simple claim: That average individual market premiums have more than doubled since ACA-compliant policies were launched in 2014. It plugged in the average individual market premiums for this year and compared them against the average indy market premiums for 2013 (the last year before all newly-enrolled policies had to be ACA compliant). It only included the 39 states maintained by the federal exchange, HealthCare.Gov, and concluded that on average, monthly premiums had increased from $224 in 2013 to $476 in 2017...a 105% increase over 4 years.